Beard brushes work great for grooming facial hair. They can work out snarls and curls, help reduce beard dandruff and leave beards looking healthier and shinier. If you have a bearded man on your shopping list, then finding the best beard brush for a great gift for that man in your life can make you a hero in their eyes. So, here is a look at some great beard brushes we have found. 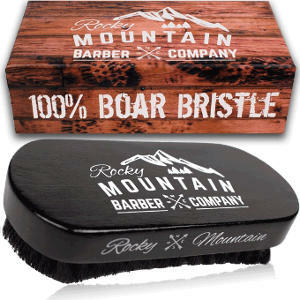 This Rocky Mountain Barber Company Beard brush is made from 100% boar bristles and contains no synthetic or nylon bristles. The bristles are attached to an attractive poached wood hand which has a shining black finish. This brush is good for grooming or even distributing beard wax or oil throughout the beard and is perfect as a gift since it is packaged in nice looking packaging box. Consumer ratings and reviews are extremely good. Users feel that this beard groom accessory is well designed and extremely sturdy. It handily spreads oil through the beard very well. People also find that it is a great size being slightly wider than the palm of your hand. It feels nice on the beard and the chin and it really helps to control even stubborn facial hair. 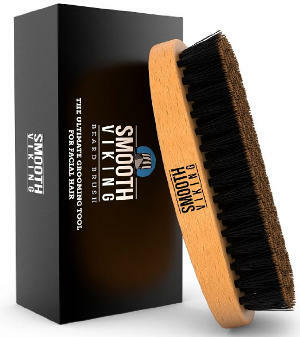 This Smooth Viking Beard Brush is made in the USA from boar hairs and has no synthetic bristles. Apart from detangling and smoothing your facial hair as well as clearing residues and dandruff, its tough bristles will also massage your skin and distribute its natural oils, dealing with the dull and dry appearance of your beard and making it look healthier. Users like the fact that this facial hair accessory has nice firm bristles and fits well in the hands while feeling good on the beard. It also makes spreading beard oil easier and it really smooths the hair. Overall, it’s really useful in taming those unruly beards. 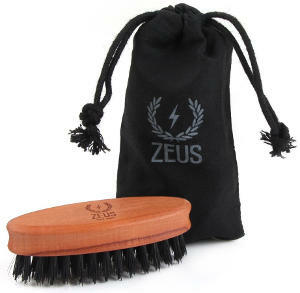 This Zeus boar bristle pocket brush is a smaller sized beard brush that is made in Germany using 3 rows of firm cut boar bristles. 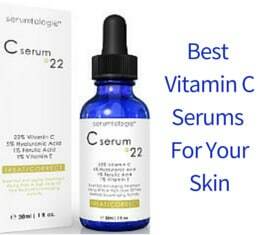 It gently massages the chin under the beard for healthier skin while still grooming and untangling your facial hair. Users like that this brush is the perfect size for traveling while still being able to work beard oil throughout the beard just as well as larger sized brushes. It is great at untangling hair and helps to style your beard just as you want. It also helps to relieve chin itch which is a major concern for most beard wearers. 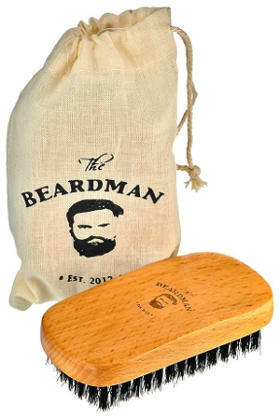 This Beardman Beard Brush has soft boar bristles as well as a bamboo/beachwood handle, and comes with a Muslin style cotton gift bag. It is perfect for grooming both dry and wet beards and comes with a 100% satisfaction guarantee. Users like that it doesn’t scrape their skin as well as its size and the fact that the bag holds the brush and a small bottle of beard oil for traveling. Another advantage is that it doesn’t lose a lot of bristles and leaves men’s beard healthy and shining. 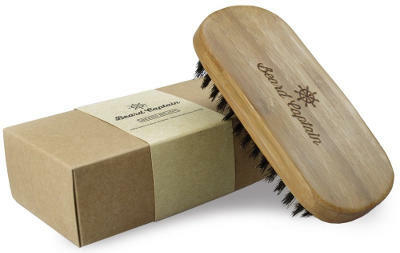 This 100% natural boar bristle brush comes with a gift box and a travel bag with drawstrings. It tames and shapes the beard while helping to detangle it and spread natural oils. Its handle is made of natural eco-friendly bamboo and has a carved finger grip for excellent convenience. 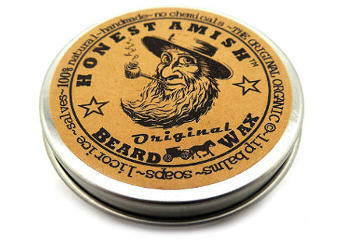 It works well with beard wax, oil or balm and is backed by a 100% guarantee that includes either refunds or exchanges. Ratings and reviews for this beard product are extremely positive. Users find that it is great for applying beard balm and actually state that it helps prevent their beard from becoming dry and itchy. It fits well in the hand and straightens beard hair easily and with less pulling. 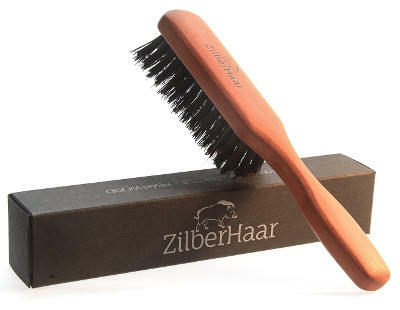 This ZilberHaar Beard Brush has a long handle for a good grip and the right stiffness of boar bristles to glide through even the thickest beards. The handle is made of smooth and solid pearwood. This product is made in Germany and it’s followed by a lifetime guarantee. Users are glad that it helps to distribute beard oils and butters better than combs or some other brushes. It is also great for training their beard and feels good in the hand. The bristles are stiff, but not too stiff. People feel that it is of an excellent quality and leaves both their beard and the skin under it feeling and looking healthy. If you want to combine both a brush and a comb in your grooming beard care, then buying a kit which contains both of these handy tools would be a perfect idea. 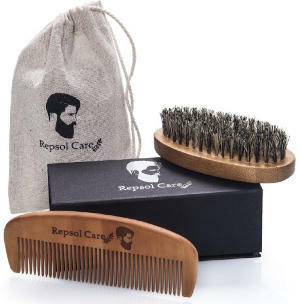 Repsol Care Beard Kit has everything, a handmade anti static wooden comb which you can also use it for your hair or mustache and it guarantees no hair pulling or snagging, a beard brush made of 100% boar bristles, a travel cotton bag and a 90 day full money back guarantee. All these accessories are contained in a luxury gift box which makes a great gift. 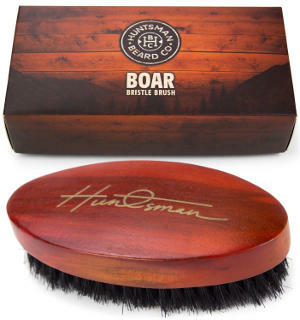 This is a beautiful looking boar bristle beard brush sold in an equally pretty looking cardboard gift box. Its finish looks really nice with the shade of the wood and the logo of the company presented on the top. It is also followed by a full refund guarantee. Users like this product and say that its bristles are just the right firmness to tame even wild beards. It fits nicely in their palm and does what it’s expected to do. It sheds a little but people state that shedding stops after a few uses. One of its biggest advantages, according to many users, is its great customer service. 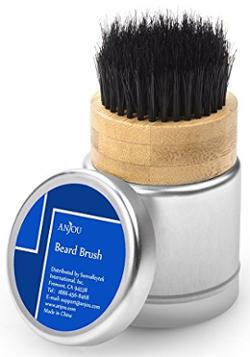 This Anjou Beard Brush has a smart design and is made of 100% pure boar bristles that are anti-static. They are also jagged to be able to penetrate deeper into your beard and remove everything that keeps it dull looking and unhealthy. That way, even the beard products you are using will be more effective and help your facial hair look brighter. According to the company, there is an advanced bristle technology which stops bristles from falling out and last longer. Also, the brush is both resilient and flexible to be able to work with different levels of beard thickness. The handle is made of eco-friendly bamboo which reduces the chances of your beautiful brush getting mold. In addition, its compact packaging makes it easy to carry on the go! 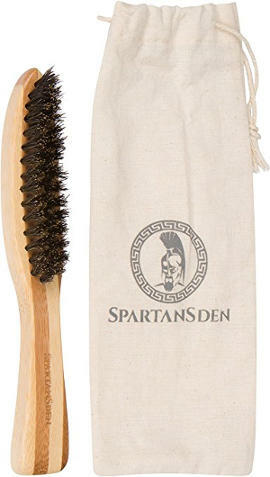 The lightweight Spartans Den Natural Boar Bristle Beard Brush has a bamboo handle and natural boar bristles. This tool is good for styling your beard without damaging its hair while it also stimulates circulation, eases inflammation and promotes growth of healthy beard. It comes with a travel bag and is backed by a 30 day money back guarantee. This military round bamboo beard brush is made of real boar hair and it has bristles that are of medium stiffness. 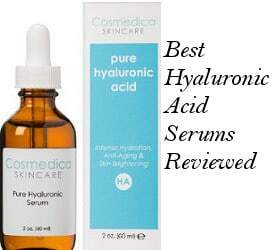 It is good for either wet or dry beards and is able to detangle hair and spread your beard oil or balm evenly. The good grip makes its use easier and more comfortable. In conclusion, if you are looking for the best beard brush to buy for yourself or offer as a gift, then the above selection will help you make a great choice. In case you need a beard comb as well, here´s our selection of the best beard combs.